Damon Brown is the young British trumpeter who made a powerful impression with his debut album 'A Rhythm Indicative' in 1998. Brown's trumpet sound echoes the pristine-toned, melodically poised approach of the late Clifford Brown, and he unfolds solos with a measured step that confirms a quiet confidence. Tim Garland's fleet and intricate tenor-playing (at times suggesting a more patient Michael Brecker) is a powerful feature occasionally, and the repertoire tends towards a mix of the various tempos and moods of the Blue Note catalogue's sound in the mid-1960's. It ranges from the upbeat swagger of the classic small hard-bop ensembles to the relaxed, Latin-tinged feel of the Herbie Hancock and Joe Henderson bands of that period. 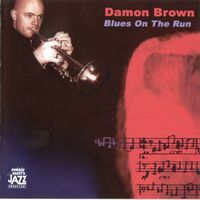 Brown's inventive, lightly stepping trumpet improvisations are consistently engaging; Winston Clifford's drumming is unobtrusively propulsive and selflessly group-oriented; and the only standard - Mack The Knife - is reinvented with an assured coolness, with Brown spinning a fresh melody over only Arnie Smogyi's stalking base and Clifford's brushes. Not a revolution but some fine playing in a familiar groove.